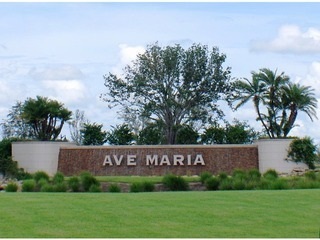 Ave Maria is a unique and exciting community located just west of Naples, Florida. Known as the hometown where you can live, learn, work and play, Ave Maria is a master-planned residential and commercial real estate development offering an extensive variety of amenities and conveniences all in one location. The Golf Club at Del Webb was designed by Gordon Lewis and offers 18 holes and 7,532 yards amongst the natural settings of preserve and crystal lakes. There is a quaint downtown filled with specialty shops and eateries, golf course, Publix grocery store, a water park, pools, parks (including a dog park), the distinguished Ave Maria University and six neighborhoods with stylish homes in varying price ranges. Properties include low-rise condominiums of only 1-3 floors located downtown (La Piazza) and single family homes ranging in size from 1500 – 1700 square feet of living space.